We are the Piggott family and live in Grimsby. Ryan our only son began having seizures in January 2008 when he was 3 years old. 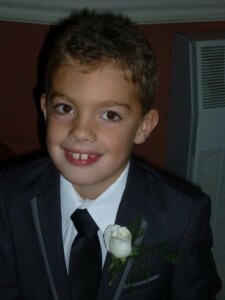 After many many visits to Grimsby hospital and being diagnosed with epilepsy, they eventually did an MRI in July 2008. Despite our asking for an MRI on many occasions before, we were convinced Ryan had a brain tumour but they simply said he wasn’t ill enough to have a tumour. Ryan was diagnosed at Grimsby as having something called NF but a few weeks later we got a phone call from the neurosurgeon team at Sheffield Childrens Hospital asking to see us. Ryan was diagnosed with a brain tumour and so began our second life, 80 miles from home at Sheffield. After major surgery, Ryan began his 19 months chemotherapy. During this time Ryan had to have 3 days or so of intense chemotherapy every few weeks and if he got sick we would have a 3 day stay during this time. This is difficult enough but when you are 80 miles from home it is even more so. I (mum) was able to sleep next to Ryan but Adam (his dad) could only travel back and forth from Grimsby each night to come back again each morning to be with his son. Thats when PACT became our lifesaver. Adam was able to have a room there for each night Ryan was in hospital so he could be there when he fell to sleep and again when he woke without Adam having to travel a 160 mile round trip tiring him out to do so. He was able to have a warm shower and something to eat and I used the PACT house when he replaced me by Ryan’s side.